In our family, Christmas means getting together over great food. We look forward to both during our yearly Christmas party. Our family bond over food. We talk about the happenings of the year that is nearing its end, our dreams for the coming year, our fervent wishes, our joyful hopes, and of course, giving thanks to the celebrant, Jesus Christ. The family's (my side of the family) Christmas party venue yearly is our home. Since we spend 80% of the Christmas party in the dining room than the rest of the abode, we make it a point to make the Christmas party decorations there extra special. Simple but special. This year, we’re going for gold! When we say gold, we mean gold accents like little touches of Midas here and there; not like Fort Knox. Just a few small doses of gold to give the dining room the appearance of both warmth and glam. Make your guests salivate with your food list written on a chalkboard with gold frame. Not only will it be a beautiful piece to ogle on, it will also save you time from answering the what-dish-is-this question. It will also be easier for your guests to put a caption to their Instagram food photos. Since we want just a touch of gold, placing a gold table runner will do the trick as opposed to a whole table cloth. A combination of a white table cloth and a gold table runner will also be beautiful. If you're aiming towards sophistication, a black table (pictured above) with a gold runner will be your best bet. One of the ultimate symbols of Christmas will truly be great dining table centerpiece. 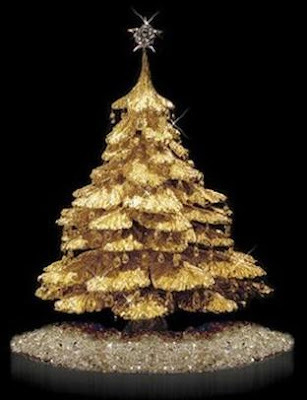 Mini gold Christmas trees will surely up the Holiday vibe come dinner time. Create a relaxing atmosphere by lighting up candles during dinner. I'm in love with these gold goblet candle holders with long stems! Beautiful! Get festive with these Christmas ball place card holders! So cute! Place cards are especially helpful for family members who will commit murder at the mere sight of each other. In order to avoid bloodshed during the season of peace, love, and harmony, place cards are necessary. 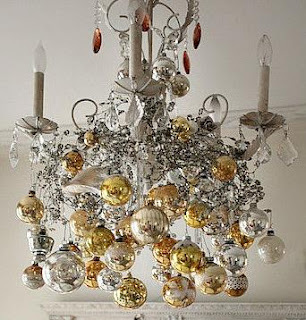 For us, decorations are not just there for aesthetic purposes. It adds a lot of jubilant spirit to the real meaning of Christmas - rejoicing in the birth of the Savior. Time to get our creative juices flowing for our family's favorite Holiday!